Fr Peter Wieneke OSA, College Chaplain in his opening statements at the Mass of the Holy Spirit on Tuesday, told the students, staff and parents gathered in Goold Hall that we come together today to realign our hearts and minds in the direction towards God. It is a phrase that is often used in our Augustinian context. We speak about a community being of “One Mind and Heart on the Way towards God.” As we begin the 2019 academic year, we take a moment to refocus on our purpose as stated in our Vision Statement. Striving for excellence in boys’ education as an Augustinian community one in mind and heart on the way towards God. We strive to achieve this vision through a wholistic education where the formation of the whole person within a faith community is our primary purpose. Our community made up of many parts, contributes to developing good, young men of Gospel values who seek the common good. We strive to graduate young men with a burning passion for learning and a desire to continually search for Truth. During the Mass of the Holy Spirit, the Student Leaders for 2019 were commissioned in their respective roles. In receiving their badges of office, they pledged to uphold the values and ideals of Villanova College. College Captain – Matthew Rolls (centre) with Vice-Captain – Will Barwick (left) and Student Council President – Nickolas Sofios (right), pictured with College Counsellor Mr Adrian Hellwig. In Term 4 2018, MMG Education was commissioned to undertake a survey of parents, staff and students to assist in gaining deep insights and research-based information relating to stakeholder needs and expectations in order to drive continual improvement in the quality of education provided by the College. 484 parents out of 968 families responded to the survey, which was a 50% response rate. 26% were parents from the Junior School, 39% from the Middle School and 34% from the Senior School. 94% of parents noted Villanova College to be their school of first choice. Over the coming weeks further results from the survey will be published. I had the privilege of taking ten young men from the College to Melbourne early in the holidays to compete at the Australian Volleyball Schools Cup. The time that the coaches and the players spent together was extremely valuable in not only building skill amongst the players but developing teamwork and comradery for the upcoming AIC volleyball season. The team acquitted themselves well and eventually finished seventh. However, it wasn’t an individual display of skill or a team set play that was the highlight. The highlight was the time spent giving feedback to the players mid-tournament and watching them employ this in the final part of the week. The players relished watching videos of themselves and receiving statistics about their performance, not for reasons of self-importance but for self-improvement. With their first week behind them, and the holiday break now just fond memories, it is important that the young men at our College shift out of neutral and into gear. Your son’s teachers are certainly not expecting him to shift into top gear immediately, but they are looking for him to start his year off positively and in an organised manner. I would like to bring to parents’ attention a couple of initiatives that they should observe from the beginning of the term. Every student from Year 5 to 12 has been given a Villanova College study planner as a mechanism to plan their term. Using a study planner helps to create, manage and monitor tasks, helps to develop understanding in particular subjects by allocating time, and helps to establish a study routine through scheduling activities. The visible nature of a study planner, placed in the right space, is also appealing to boys. In order to use the study planner, I would ask parents to purchase a non-permanent or whiteboard marker with a nib size no larger than 1mm (Stabilo or Artline brand as a suggestion) for their son. Middle and Senior School students no longer receive a physical diary within which they have traditionally written homework and due dates for assignments. The study planner will be their mechanism for planning assignments however teachers will now enter homework in the student’s eDiary. The eDiary is a facility in the Student Café and as a result parents will be able to see homework set by teachers in the Parent Lounge. This is a website with units of work on different study skills topics, looking at how students can improve their results as well as other resources and planning templates to make dealing with schoolwork easier. At times throughout the year, your son may work through some of the activities during class, however, parents might like to encourage the use of the website as the need arises. It is a great idea for students to set up a folder for each subject that stays at home, somewhere to file away past tests, assignments, completed topics and to keep everything together for that subject. Each night students should work on homework first, then assignments or test preparation. Following this, students need to look for other things they can do to enhance their understanding of their subjects, such as making study notes, doing extra questions or revising earlier topics. The best way to avoid distractions is to work in half hour blocks. One of the biggest mistakes students make is leaving their study notes until just before their examinations. One of the best habits students can get into is doing their study notes throughout the year; at the end of each topic is a good time to do this. Whenever students don’t have much homework, they should be disciplined enough to work on study notes. It would be important to put all this information in the study planner. I wish all our young men at the College a successful year ahead in their studies. Parents are welcome to call, email or visit (please sign in at College Reception) anytime during our working hours of 7.45am – 3.30pm. We are also available during the school holidays, but it is advisable to call or email first in case the office is unattended. Depending on your son’s classes and year level, he may be required to install additional software from the BYOD Software page of Moodle. If your son’s teacher requests additional software to be installed (e.g. Adobe Photoshop, etc) this is FREE and already available to download from the BYOD Software page of Moodle. Note: if you are installing Adobe software ensure you follow the Adobe installation guide at the top of this page. As always, if you have any problems with these installations ask your son to visit the IT Helpdesk at the times indicated above. Most students at the College are now using OneNote. However, there are several versions available. If you son has a new Windows 10 laptop, he already has OneNote for Windows 10 pre-installed. He will most likely be using this software. Students in older year levels may be instructed by their teachers to ‘switch over’ to using OneNote 2016 for various reasons. If this request is made, your son can install this version of OneNote FREE from the BYOD Software page of Moodle. As you would be aware, 2019 sees the cessation of the printed and bound College diary in the Middle and Senior Schools. Traditionally, the diary contained a printed version of the annual Acceptable Use of Computer Network Resources agreement. Students and parents would sign this document to indicate agreement with the guidelines for the calendar year. This printed agreement is now an online module, accessed via Moodle. Mr Greg O’Neill (Head of Middle School) and Mr Matt Levander (Head of Senior School) will be sending correspondence to parents regarding procedures and timelines for completion of this online module. In the Junior School, students will review this agreement according to their classroom teacher’s instruction. Our Year 5 students have commenced their Villanova journey with the same type of device – a Windows 10 BYOD laptop. After they attend camp, Year 5 students will have access to a range of short modules to learn how to operate and maintain their laptops – for many students this is the first PC they have owned and/or used. These modules will be based on simple processes (Start Menu, System Tray, What is a Virus, Folder management, etc) and Year 5 classroom teachers will be encouraging students to complete these modules to earn badges during Term 1. It is fair to say I am not a camper in my leisure time (and I can hear the roar of laughter right this minute from those that know me)! I actually love the idea of being under the stars, spending time around the campfire, but preferably if someone else does all the planning. My brain is just not wired for that sort of preparation in order to have some time to relax outdoors. On more than one occasion, due to work or sport, my wife has been the one to pack up the car and join friends for camping at the beach on Stradbroke Island, or in zero degrees at the Clarence River in northern NSW. Perhaps the country upbringing she had comes out just as clearly as my own beachside city one. However, our College camps are without doubt one of my favourite times with the boys (apart from AIC basketball in Term 3), as we have the magnificent locations of Mudjimba for Year 5 and Noosa for Year 6. Our staff show outstanding commitment and leave their own families for three days to be right there with the very students they will be teaching this year. The purpose of our camps is to build genuine relationships more quickly to enhance learning and social interactions from Week 3. There are experiences that vary from spending two nights away from home to a range of outdoor activities – these allow strengths to shine in individuals, as well as provide moments of high support in challenging moments. We need each other’s help to manage the dorms, organise our dry and wet gear and serve at meal times. Names, likes and dislikes and fun facts are learnt far quicker in this environment than if we were working at school. It is a crucial rite of bonding that these camps provide for us all. Taking all our students together as year level cohorts is important and we are fortunate to be able to do this with large numbers. Your son has not just one or two class teachers for the year, but a collaborative teaching partner that they will spend time with for between 50 to 100 percent of their school day. They will have other teachers as coaches, coordinators and leaders for co-curricular activities. Your son will get to know many teachers on the College Camps, including Mr Adrian Hellwig (College Counsellor), Father Saldie Resolado OSA (Campus Minister) and Mrs Joanne Bayley (Learning Enrichment Coordinator). The boys will see our staff work together to make the camp experience as enjoyable as possible, as well as show some personal talents or challenges during activities. Our students need to see the teachers as human beings who are capable of many things, including humour, but who also need help and support at times. I hope your son returns from camp with a smile from ear to ear. Dramatic recounts of sleeping in dorms, the camp food and their achievements are all part of the fun. Don’t be alarmed if the shower gel looks to be unused – despite our best recommendations, it can be all part of the fun to rely only on a little deodorant for 72 hours. Rest assured some lost property will be at school in the weeks to come, however the chances of finding any gear mostly relies on items being named clearly. Be sure to check what you hang up on the washing line at home for anything that looks to belong to someone else. Just send it in to us and we will hopefully find the rightful owner. There will be some adjustments after camp for your son. Work routines will begin, homework tasks are to be expected and our curriculum will gain momentum. Be vigilant in using the College diary, One Note and/or Google Docs through your son’s BYOD. Use the Villanova College App and Assessment Calendar to prepare as best you can with your son for his upcoming work and co-curricular activities. Communicate directly with your class teacher, as they are the best source of information. Social media or mates from other classrooms may not always get the details right for your situation. The Junior School Parent Information Evening will be held in Week 4 on Wednesday 20 February. Year 5 parents are to meet in the Hanrahan Theatre at 5.30pm and we ask all Year 6 parents to meet directly in their son’s classroom at 6.30pm. We look forward to seeing everyone then. Welcome back to a new school year. I would like to extend an especially warm welcome to the parents who have just joined our community. I hope and pray that you and your son experience the strong sense of community that we espouse here at Villa. The priority for this evening is to meet your sons’ teacher/s. Tonight is an important step in forging the partnership between student, teacher and parents as we navigate these early years of Middle School. The theme of the article has implications for all of us, both parents and teachers. The adolescent journey is a time of great change and development; but it is also a time of emotional peaks and troughs, and a time of unpredictability. Centuries of schooling and parenting have re-enforced this view, and, more recently, neuroscientists have confirmed it; and now behavioural psychologists can explain it to us. As Middle School teachers, we have been paying attention to what the research says about teens, and how they learn best. As Brooks rightly highlights, teaching is no longer a process of downloading knowledge into students’ brains. Teachers are rather facilitators of learning. True learning is a process of exploration and deepening of understanding. And learning is emotional. It needs to be. We all learn best when we’re emotionally invested. Some might ask how emotionally connected can you be to calculating parabolas? Or how emotionally connected you can be to sedimentary or metamorphic rocks? But the science of teaching is very much the art of creating emotional connections with the process of learning, irrespective of the content. And a desire for knowledge (or a search for truth) is innately Augustinian. Our Middle School teachers are tasked with cultivating and fostering that love for learning. When boys are emotionally invested, they have a hunger for success. And as Brooks emphasises, when a quality relationship exists between teacher and student, the desire for learning peaks. As parents, you are invited and indeed encouraged to be a part of that relationship. We want you to walk with us on this adolescent journey. And we want to walk with you. Neuroscience tells that adolescents can’t fully access the ‘executive function’ part of their brain; among other things, it’s the bit that helps them make good decisions. As a result, they rely on another part of the brain, which also happens to be the emotional epicentre of the brain. As previously mentioned, the teenage years can see peaks and troughs of emotions and times of unpredictable behaviour. In an era when a person’s mental health is intrinsically related to their overall wellbeing and success, we must be vigilant with monitoring the environments in which our young people exist. With the current levels of poor mental health in schools (and society as a whole), as teachers and parents we need to be arming ourselves and our young people with the skills to manage wellbeing. As with all illness, prevention is better than cure. Villanova remains committed to teaching the social and emotional competencies that young people need. Throughout the year, you’ll hear more from me about this, and the important role that parents need to play is in fast-tracking this learning. Thank you for your attendance tonight. It is a gesture of support that is truly appreciated by our staff. I hope that throughout the year, your relationship with your son’s teacher/s continues to grow and strengthen to be one of quality. It is these quality relationships that help support our young men, especially when they need it most. On behalf of the Middle School staff, we look forward to working with you and your sons throughout the year. Later in the year, we will be hosting another parent information evening for Middle School parents. This event will explore in more detail the current research around neuroscience, adolescent behaviours, and the development of identity and masculinity constructs. It will also explore the role that leadership and role-models (including parents) play in the lives of teenage boys, and the emerging risk-factors that can inhibit them from reaching their full potential. More details about this event will be released later this month. 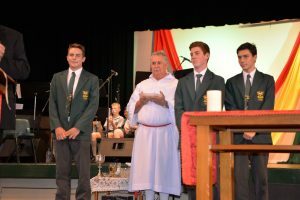 As we experience our first full week of the new academic year, the spirit of Community – our focus gateway value for 2019 was celebrated at our annual Mass of the Holy Spirit on Tuesday. The wisdom imparted by Father Peter to the congregation of students, staff and parents reinforced how special our community is- we celebrate the triumphs and pull together through challenges knowing we are forever strengthened by our connectedness as members of the one community. After communion, the Student Leadership Team was installed, and the Seniors were commissioned as leaders of the student body, pledging to be of humble service whilst being inspired to fulfil the promise of their motto – ‘where passion lies, success follows’. The start of the school year for many here at Villa is a time where we begin the planning and goal setting for the year in order to achieve success. To quote great American businessman, Ted Turner ‘you should set goals beyond your reach, so you always have something to live for’. This begs the question, what exactly is beyond reach? What are the things stopping us achieving the lofty goals we set ourselves? Well I am a strong believer that the only thing stopping us attaining our true potential is ourselves, our own minds, a lack of determination and self-belief. The pages of history for 2019 remain unwritten, this year still new and unclaimed. I challenge you to place your mark on this year, achieve the things you never thought possible and push your limits and surprise yourself. Search for the wonder in yourself as St Augustine challenges us to do. Proudly display your passions and set your goals high and share your ambitions with others, write down your objectives making yourself accountable for what you aim to achieve, giving yourself the best opportunity to obtain these goals. I would like to congratulate Matthew and the entire Student Leadership Team for their proactive start and ambitious agenda for the year ahead. I ask the Senior School student body to support the Senior cohort in all their endeavours to make this a successful year. It is crucial that all Senior School students settle back into positive and purposeful routines of study and are conscious of their engagement within the classroom environment to truly be accountable for their commitment to their learning pathway. The study planner poster that Senior School students have been distributed with to place in their home study/bedroom is an overt reminder of the importance of an effective study plan and the establishment of academic goals for the semester ahead. The Academic Coaching Program in Year 11 and 12, whereby our students are supported and mentored through these processes of goalsetting and study/revision, reinforce an intentional focus of engaging our Senior School students in effective habits that will prepare them for the challenges of the system of Senior schooling. I would strongly encourage all parents to discuss with their son the way in which he has started and if there are any significant concerns to make immediate contact with the classroom teacher or academic mentor in Year 11 and 12. The importance of open and honest communication between students, parents and teachers is critical in ensuring that students maximise their learning potential within an environment of accountability and care. The Senior School Parent Information Evenings commenced this week. The focus points of these evenings are to outline the strategic intentions of the Senior School this year as well as to outline way in which your son will be supported both inside and outside the classroom. A copy of the presentations will be made available on Parent Lounge so that you may reinforce the key messages shared by staff on the night. Earlier today, a contingent of our Student Leadership Team attended the annual AIC Ecumenical Service which was hosted by St Edmund’s College. During the service, the underpinning spirit of sportsmanship and fair competition was certainly emphasised. As Head of Senior School, I am largely present at most sporting fixtures throughout the year and I expect the highest conduct by our students with respect to their appearance and how they engage with students from other colleges. Spectators who remain for the Firsts fixture will be required to be attired in full academic uniform, commencing this weekend at our first home round against St Edmund’s College. I wish all Senior School students representing the College this trimester a successful and enjoyable season. “Life is not a salvation up ‘in the cloud,’ and waiting to be downloaded, a new ‘app’ to be discovered, or a technique of mental self-improvement…. “The salvation the Lord offers us is an invitation to be part of a love story interwoven with our personal stories; it is alive and wants to be born in our midst so that we can bear fruit just as we are, wherever we are and with everyone all around us,” (Pope Francis 26 January, 2019 – World Youth Day vigil, Panama). These uplifting words from Pope Francis provide us with a significant insight: that the spirit works right in the middle of the normal activities of school life – especially when we share our stories and our passions. This spirit was evident at the opening Mass. Fr Peter Wieneke OSA, College Chaplain, spoke about the importance of every year group, and every student. We are all parts of one body, animated by one spirit – a point memorably illustrated by the use of a skeleton with the first reading. One important aspect of the Villanova community/body is provided by the different ministries. These provide channels for action such that the boys’ energy and talents are used for the common good. YAYM (Young Augustinians) is for Middle School and meets on Wednesday lunchtimes. YCS (Young Christian Students) discerns how to improve life on campus, for example by organising visits to Junior School students. Meetings occur on Friday at lunchtime. St Vincent de Paul provides practical support for people who are vulnerable or at risk in the local community. Meetings are held on Tuesday at lunchtime. AFAS is our main overseas outreach, and is the agency through which we support three sister schools in the Philippines. Meetings are held on Thursday at lunchtime. Many students also serve as altar servers and Eucharistic Ministers. This year Campus Minister, Fr Saldie Resolado OSA, will guide these students, and any student is welcome to join. All meetings are held in the RE Centre, next to the Curriculum Office. Last year, we were fortunate to employ Eric for a term, under the Work and Welcome scheme. This is a scheme where people from refugee background are given their first employment in Australia. 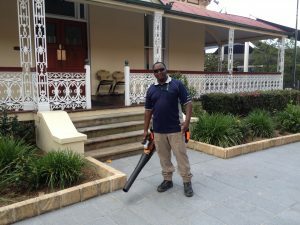 With the friendship and guidance of several Villanova staff, Eric has now found continuing employment in a grounds and maintenance role at another Catholic school. He became a very popular figure at the College, because of the pride he took in maintaining the campus. Over the holidays a team of four young old boys organised and ran a pilot program at the College, teaching children from disadvantaged backgrounds about coding. These recent old boys worked in partnership with the St Vincent de Paul Society and the Enactus Society of QUT to develop and test the program with three or four children over a series of six lessons. The aim is now to expand the program whilst also offering conversation classes for parents of refugee background. Thanks to the generosity of Villanova families we now have a stock of laptops to use. At the conclusion of the 2018 school year, the Sports Office was very confident with the progression made in our pre-season trial processes for the AFL, cricket, volleyball and swimming programs so that we would be in a good position leading into the 2019 season. It always strikes me that no matter how well we are prepared and organised leaving 2018, there is no escaping the usual ‘first week frenzy’ as we prepare for the trial matches and events scheduled the first week back. Now that we have reached Week 2 of the school year, all training programs across all sports and year levels are set for the season ahead. These schedules along with the coaching contact details, team lists and by-laws can be found on the College’s web site. The Sports Department communicates information to parents (and students) via the College’s newsletter (Villa View), website, morning notices and the new Villanova College App (this is a must to install on your phone). Regular access to the College’s website is essential. Please be advised that we aim to post the weekly draws on the website by Wednesday of each week. All team lists for each team sport should be posted by Thursday if not earlier. As part of the ongoing and far reaching learning process at Villanova, we do require our students to take responsibility. When a student commits himself to a team, the College expects that he makes every effort to attend all training sessions and games throughout the season within reason. It is not the responsibility of a student to pick and choose which sessions they would like to attend. If a student’s training schedule conflicts with any other Villanova co-curricular commitment we will be more than happy to negotiate an alternative schedule, however, your son must communicate this to the College via the Sports Department. As a rule, both the Director of Sport and Director of Music have agreed on the following when there is a clash between sport training and music rehearsal. Please consult the respective Director of Sport/Music to arrange the specific alternate schedule. Students in ‘A’ teams (two training sessions per week) will rotate rehearsal with one training session every fortnight; i.e. rehearsal and training one week, 2 training sessions the next. Students in all other teams (one training session per week) are to rotate training and rehearsal every fortnight, i.e. rehearsal one week, training the next. I must congratulate the many coaches and players who represented the College last weekend in cricket, swimming, AFL and volleyball trials. In order to move the ‘sporting elephant’ we need many hands-on deck to ensure that all Villanova College teams are well prepared and organised. I thank the many people who have assisted the sports program so far by fulfilling the various roles needed for things to run smoothly. Villanova heads into Round 1 of competition this weekend against St Edmund’s College (SEC) in cricket and volleyball and various schools in the AFL. I ask all players to be focused and ready for battle as we look to commence the season well. Our swim squad will travel to St Peter’s Lutheran College via buses organised by the College tomorrow evening for the first official AIC swim meet of the season. As always, to gain good results we must put a substantial effort into our training. I ask all coaches and players to focus on what they need to do at each training session each week so that improvement can be made. The next challenge is put this into action on game day. The fact is we need to train hard and play hard every week to gain positive results. Pride in the jersey, leaving nothing in the tank and giving our best to our College and to our mates is what we want, no matter the result. Good luck to all this weekend and enjoy. Go Villa! It is College policy that the supervision of students by attending staff ceases 15 minutes after the completion of the advertised finishing time of the training/practice session. Round 1 AIC Fixtures – Friday 8 and Saturday 9 February, AIC Cricket and Volleyball v St. Edmund’s College (SEC), AIC AFL v St Edmund’s and Ashgrove (ASH). Please refer to the College’s website to view all times and venues for this weekend’s fixtures v SEC/ASH. Simply scroll down on the College’s home page to the ‘Latest News’ section and click the ‘Weekly Fixtures’ section. I would like to take this opportunity to remind players and parents that cricketers must wear the appropriate uniform to all AIC games. This uniform consists of the Villanova cricket shirt, Villanova hat or cap and white pants for all players. It is not acceptable for any player to wear any club cricket shirt or hat when representing Villanova College. All players are to have their own box protector. It is compulsory for all players to wear a helmet whilst batting and keeping up to the stumps. Training sessions have now been finalised and all players are expected to attend all sessions. If for some reason a student is unable to attend training, we ask parents to email the coaches directly (not the Sports Office). The training schedule and coaches contact details are posted on the College’s website. It is important that all players check their team lists, as there has been player movement in all year levels. Boys have been moved around since the trials last weekend and there are still opportunities for players to be moved around throughout the season. Please be mindful that our coaches are mainly Old Boys, outside coaches or parents, most of whom are volunteering their services free of charge. Please be mindful of this if you need to discuss any cricket matters with them. When coaches are conducting training sessions, parents should only assist if you have been approached by the coach to do so. Many coaches need the assistance from parents to assist during the season with umpiring and scoring duties. We ask parents to offer their services so as there is an even distribution of duties so that not one person is burdened each week with the same duty. Parents of boys playing on the Andrew Slack Oval are asked to man the canteen during their son’s game each Saturday. Information regarding this was emailed to all parents of those students who were selected in the 8A, 9A and First XI cricket teams. Last Saturday was the last trial game for coaches to observe players before finalising teams. In most games played the results were very encouraging with some teams having a win on the day. Well done to those teams and coaches. All team lists will be updated and placed on the College website – please check from Wednesday afternoon each week. The College website is the first place to visit for information regarding when and where your son will be playing each Saturday. This is where you will find information on training schedules, game times and playing venues. In order to host home games, we do require a huge amount of help. From time to time each player will be asked to perform a court duty – linesman. We ask parents to support the College by ensuring that your son is available and attend the designated court duty before or after his game. Due to the number of home games could I please ask parents to make yourselves available to assist in the canteen. At the trial game last Saturday, the barbecue was lit to prepare bacon and egg wraps for those early arrivals. Thank you to Jeremy Meredith, Robyn Gunning and Rob Abraham for their assistance. I am sure those of you who had a bacon and egg wrap were very appreciative of their time. Round 1 begins this week against St Edmund’s. All players will need to be prepared for the unexpected when playing St Edmund’s by chasing the ball no matter what. With a new volleyball season about to begin the players motto is – Be Engaged in What is Happening (on the court). Players are asked to be in correct uniform for the start of the volleyball season – no rugby or basketball shorts, and no black socks. Please check the College website for more information. We kindly ask parents to assist when their son is rostered on for court duty, or during pre-game warm up as per the schedule below. Firstly, I would like to thank all those parents and players for their efforts and participation at our recent trials. It certainly made for a great start to our season and demonstrated to us as coaches that we have many talented players to work with this year. All coaches have now managed to come up with squads for all year levels. As previously mentioned, these squads are not set in concrete and will continue to change throughout the season as we see fit. This weekend marks our first official fixture and we need to be switched on and ready to go come Friday and Saturday. I ask all players to be at your designated venue at least 20 minutes prior to the first bounce so we can have an efficient and productive warmup. Some coaches may have requested earlier, so please check with them to ensure you have the correct start time. All players are required to wear the Villanova rugby shorts and socks and ensure they each have a mouthguard ready to play. Jerseys were given to the boys last week so please ensure this is also brought along to all games. Training will be on Tuesday from 3.30pm – 4.30/45pm at Villanova Park for Year 8/9 and Open squads and Year 6 and Year 7 teams will train on Thursday from 3.30pm – 4.30/45pm at Villanova Park. A reminder that all players will be transported by school bus to Villa Park, however parents are required to collect their son from training. I encourage all players to arrive early and stay behind to support your teammates this Friday and Saturday. We look forward to seeing all players and spectators this weekend to kick off what promises to be an excellent and exciting season. Our preparation schedule is now under way with squads training each morning at Langlands Pool, the Inter-house swimming carnivals completed and the Friday evening meets beginning. I thank all the students and parents who have made the commitment to attend the training sessions and encourage all boys to attend as many sessions as possible. With only four weeks of training left until the competition at Chandler, we need to be training regularly to be at our best. The walk up the hill after training can be difficult for some of the younger boys who also must carry their school bags. I would like to suggest that parents make a stop at the College on the way to Langlands Pool and deliver the bags to the classroom or to the Goold Hall foyer where staff are available each morning. The boys will then only require their swimming gear and their school uniforms for after training. Year 5 boys who have been on camp this week are not expected to attend the Friday carnival at St Peter’s, but are welcome to do so if they feel they have the energy. The first of our Friday morning breakfasts will begin this week. Thank you to the team of parents who are helping prepare for the hordes of hungry swimmers. The boys look forward to the breakfast very much and are most grateful to everyone. The Villanova swim squad will travel to St Peter’s tomorrow. A bus will depart the College by 3.15pm and should return by 7.00pm. A full program of events is posted on the College’s website within the sports section under AIC Swimming. We became aware of an issue with the new Villanova jammers this week. As a result, we have had an initial meeting with the supply company and they are addressing the problem and will replace the togs with the correct ones. The fabric used was not the correct type and is not suitable for our purposes. We will find out more information about the exchange process and the time lines for this later in the week, and when I have more information, I will email all parents. My apologies for the inconvenience, but the company was most helpful and is working to rectify the problem as quickly as possible. Boys who will be nominated to swim in the Lytton District swimming trials will be given the relevant information next week. The trials will be held at Moreton Bay College on Friday 15 February. Students who are nominated for this event must find their own way to and from the event. Due to the nature of this trial, only three – four boys per age group can be nominated from the College for each stroke. We are also looking for a parent to nominate to act as an official for the day as no staff from Villanova will be released to attend. The Met East Swimming trials will be held at Chandler on Tuesday 5 March. Students who turn 13 years or older in 2019 are nominated directly to these trials based on qualifying times. Students turning 12 years or younger must attend the Lytton Trials in order to gain entry. Any student who wishes to participate must see Mr Stariha for all the necessary forms. Please note a $20 fee will be charged to each swimmer who wishes to nominate. Boys should make themselves available to play school rugby/football. The AIC pre-season/trials commences at the end of Term 1 and throughout Term 2. The season consists of two trial games and seven rounds as per the College calendar. Please be aware that College commitments take precedence over club commitments as per College policy. School rugby/football is played on Saturday mornings between 7.30am and 3.00pm as per the College calendar. All A and B teams will have two training sessions each week. C teams and lower may only train once. All Year 5 and Year 6 training will be at Langlands (rugby) or Whinstanes (football). Year 7 – Year 12 rugby (plus First/Second football) – Tuesday and Thursday afternoon at Villanova Park 4.00pm – 5.15pm approx. Year 7 – Year 12 football (excluding First and Second teams) Monday and Wednesday afternoon at Villanova Park. Allowing your son to participate in AIC rugby/football, helps to promote school spirit, camaraderie and a sense of personal achievement in representing his College. 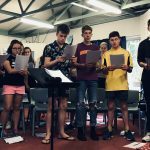 Combined Music Camp 2019 – Our combined 2019 music camp with Loreto College was another resounding success! 175 students travelled to Mapleton to rehearse with some of our state’s finest music educators. 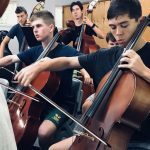 Dr Ralph Hultgren (Band), Mr David Maddick (Strings), Ms Astrid Jorgensen (Choir) and Dr Paul Svoboda (Guitars), led our students through nine hours of rehearsal across a 36-hour period, cramming almost a term’s worth of rehearsals into one weekend. On the Sunday afternoon, camp concluded with our regular camp concert in the Hanrahan Theatre at Villanova College. The students shared the music they had been preparing to a capacity house and acquitted themselves marvellously. Our finale, a choral and orchestral arrangement of Australian folk songs, elicited a standing ovation from the audience – it was a great experience for our students and a fine indicator of what lies in store for both music departments in 2019. I would like to take this opportunity to thank the many parents from both Villanova and Loreto who gave up their weekend to join 175 teenagers on the Sunshine Coast Hinterland. I also thank the Loreto and Villanova Music Support Groups who organised the barbecue to feed our campers upon return to Villanova on Sunday afternoon. Finally, I would like to thank the tutors, teachers, and support staff from both schools who assisted in ensuring this camp was the success it became, your time and effort is most appreciated! All lessons and rehearsals have commenced aside from our Irish Ensembles and Jazz Band. Please ensure you check emails for messages from teachers and ensemble directors. If you are unsure, do not hesitate to contact us through the Music Office for further clarification. The rehearsal schedule for Term 1 can be found here. To assist us with our duty of care before school, all Ensemble Directors will be marking attendance at the start and conclusion of each rehearsal. Parents of students who are marked as absent without an explanation will receive an auto-email from the Music Department seeking clarification. Whilst we acknowledge that Student Services and the Music Office may be notified of your child’s absence, an ensemble director is not privy to that information before school unless they are contacted directly. In the interests of ensuring we are all aware of student whereabouts, we will send the auto-email in the morning to ensure our supervision responsibilities are acquitted. I understand this may cause a little frustration; however, I would like to assure you all that we take our responsibility for the care of your child very seriously. Please include your son’s ensemble director in any absentee contact so that we may ensure all records are accurate and up-to-date. This Tuesday, our music team had the opportunity to meet and induct our Year 5 students into the Music Department here at Villanova College. Students have met their tutors and have been shown the spaces in which their lessons will occur from next Tuesday onward. All loan agreements for instruments have been distributed to students this week. Please ensure these make their way out of your son’s bag into your hands for signing. We cannot release an instrument to your son until the loan agreement has been returned. Your son will participate in the annual Jump Start Day during Week 5 this term on Tuesday 26 February. Further information will be sent home regarding this opportunity next week. We will be spending much of the day learning how to participate in ensemble, concluding with a concert for families commencing at 5pm. It is always a great event – I strongly recommend you place the date in your diary! We understand that in some cases your son may not have been allocated his first-choice instrument. In speaking with the students yesterday, I assured them that our teachers have done their utmost to ensure we placed them on an instrument that they would have the most success, with the requisite practice completed. I am really looking forward to hearing these groups play at our concerts later in the year. 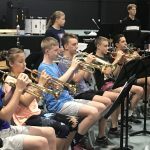 Mr McKechie, our Head of Brass, is commencing a Brass Band at Villanova College in the hopes of sharing his passion for this musical genre with our talented students. He has approached a number of students and families regarding this opportunity. Rehearsals for this new ensemble will commence on Tuesday 12 February and will occur every fortnight thereafter. I strongly recommend students taking this opportunity and look forward to hearing this group perform later in the year. Thank you all for your continued support of Villanova Music. Cricket Grips and Badges – These can be ordered on the Flexischools site. They are currently in stock and will be delivered to your son. Supporters’ Shirts (Men’s and Ladies fittings) – These can be ordered on the Flexischools site and are currently in stock. They will be sent home with your son unless otherwise advised. 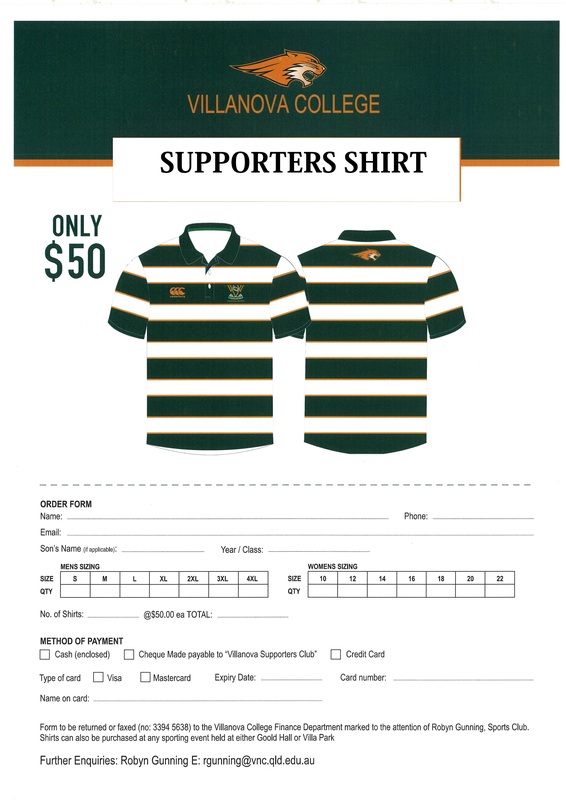 Please note: These items are independent of the Villanova College Uniform Shop and are only available for order via Flexischools. For any further enquiries, please telephone Mrs Robyn Gunning on 0400 841 720. The Villanova College Tuckshop is a modern, commercial area of your school that provides an affordable and nourishing breakfast, morning tea and lunch service for the boys. Preparation begins from 7.00am with the day concluding at 2.00pm. We run a self-service system, with a diverse menu consisting of both freshly prepared and pre-packaged items. The Tuckshop is managed by a paid Convenor but could not exist without its dedicated volunteer helpers. We welcome help from mums, dads, grandparents, caregivers and friends. Helpers are rostered on one day every four weeks with most volunteers commencing at approximately 8.30am. However, should you only be available for a day a term or even an hour or two, please do not hesitate to volunteer as you will be most welcome. Our helpers are provided with a cuppa and cake for Morning Tea, a delicious lunch, lots of laughs and an opportunity to see their sons in their school environment. If you are a little nervous about volunteering alone, why not join with a friend? Villanova House System – There are four Houses at Villanova College: Crane, Goold, Heavey and Murray – named after early Augustinian Bishops. The first Australian Augustinian Bishop was Father James Goold and the three other Bishops: Martin Crane, James Murray and John Heavey were important Augustinian pioneers who worked towards the creation of a strong Augustinian presence in Australia. This is the first story in a series of four. James Alipius Goold was born in Cork, Ireland in 1812. He entered the Order of St Augustine and was ordained in 1835. He became aware of the lack of priests in Australia and following permission from the Irish Provincial, arrived in Sydney in 1838. He found that there was governmental suspicion of Catholicism as it could potentially provide the Irish convicts and ex-convicts with a rallying point. A greater problem was that many of the Irish who lacked contact with their church since arriving in Australia, were often not willing to embrace it again. Soon after Goold’s arrival he became parish priest at St John’s, Campbelltown (1841) and built a presbytery, several churches and a number of schools. He always observed Augustinian feast days, a challenge when he was the only Augustinian in Australia at the time. 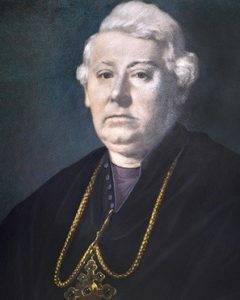 After serving the Campbelltown community for nine years, Goold was appointed the first Bishop of Melbourne in July 1847. His trip to Melbourne in a stage coach was held up by bushrangers on the way, and has become quite a legend within the Augustinians. He is also known for his support of the miners at the Eureka Stockade. Once in Melbourne, Goold collaborated with other protestant religions to fight the government into supporting church schools with financial aid. He was also a leading advocate and organiser in the building of St Patrick’s Cathedral, Melbourne in 1850. Goold had always hoped to establish an Augustinian monastery in his own dioceses. However, it was not until after his death that the first Australian community of Augustinians was established. AFAS Elders, in conjunction with Greg Cooley Wines, invite the Villanova Community to enjoy ‘ANYONE FOR TENORS – TENORI IN CONCERT’ on the Cassiciacum Gardens (outside Veritas) on Saturday February 9 commencing at 5.30pm. Bring your own picnic basket or order one when you book online. There will be a cash bar in operation. Bookings are essential. Please note: As showers are predicted for Saturday, please note Tenori in Concert will be moved indoors if required. For all booking details, please click here. ISCA is looking for Homestay Families to host visiting International students who are here to study and enjoy the Australian High School experience. The age group ranges from 15 up to 18 years of age. Please contact International Student Care Australia (ISCA) by visiting our website www.isca.net.au or contact us on (07) 3851 0704 during business hours or you can email us at isca@isca.net.au for more information. ISCA pays a competitive market rate per week to reimburse you for your costs.